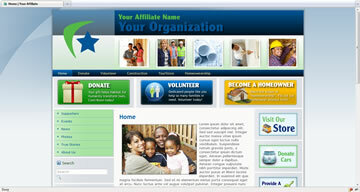 Photos on the header can be personalized to your affiliate. 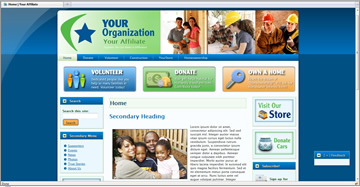 The great big Volunteer, Donate and Homeowner buttons that everybody loves can be placed at the top of the page, or on the left or right sidebars. 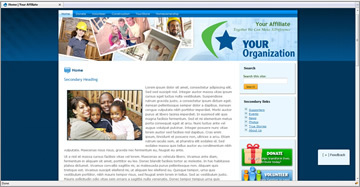 Left and right sidebars can be turned on and off and/or reside only on specific pages you choose! 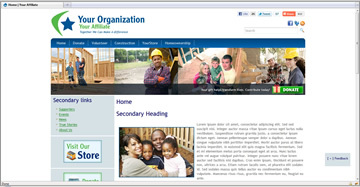 Visit our demonstration site to view the default page structure, a sample contribution form, sample events, the volunteer skills and information form and the homeowner interest form. You can fill out forms, make a test contribution or sign up for an event (all donations or fee-based events will take you to the PayPal Sandbox where you can complete the "test" transaction). Click any thumbnail to see an enlargement.